It has been a tough few days as news of increasingly desperate circumstances have filtered their way through to the Mondo and HELP teams. Initial reports of villages being totally flattened were verified as the scale of the devastation slowly became clear. In one village, Gunsa, over 50 people have been confirmed dead, at least 15 of those children. In Bhotenamlang there have been around 45 deaths. The list of injured across the valley numbers in the hundreds if not the thousands. Although there were some initial helicopter flights, most of the villages have not received any outside assistance. In some cases, the schools which we have built have stood the test of the quake and are being used to shelter villagers. sent 8 boxes of medical equipment to the region and an additional two have been taken by helicopter to Shugenche and Gunsa villages. 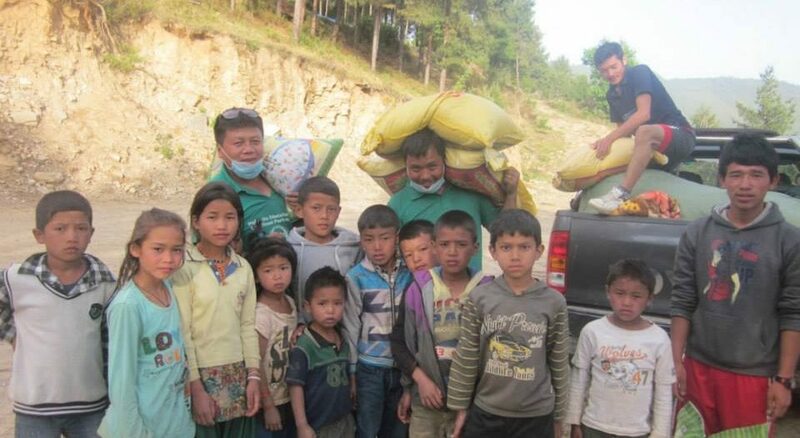 arranged on 30 April for 5 tonnes of food to be taken by two trucks to Helambu. 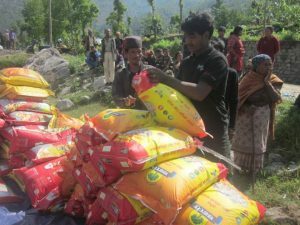 Part of the consignment was made up of 100 bags of rice, 100 bags of beaten rice, tons of noodles, oil, sugar, salt, biscuits and lentils. Tarps, blankets and water flasks are also being collected for transport. HELP have also bought 75 solar panels with batteries and convertors to help resume communication in each village. About 25 of them have already been transported to affected regions. helping re-connect water supplies to the villages.